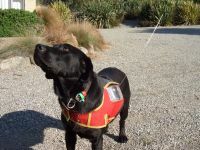 The story began with during a meeting between myself and Adrian 'Snow' Dance, who has been working in Search and Rescue New Zealand for many years, and who trained search dogs. His original website (but now a bit out-of-date) can be found at http://www.k9nz.co.nz/ . He developed a system where the dog would carry a jacket, containing a GPS and special electronics. The jacket had two 'tabs', who could be pulled out, one by a person needing help, and the other by the dog itself. The 'tabs' had a small radio transmitter in them, which could be tracked with radio finders. The track of the dogs, and special events like the dog barking, and the tabs being pulled, would be stored in the GPS as waypoints. The dog was trained to return to his handler who then could download the GPS data to a computer, and trace the dog's track and all events on the way. With my background as a HAM radio operator, I immediately asked, why don't you fit the dog with a transmitter, so you have live data on his position? Research was done, and ideas thrown around, options looked at and discarded. Satellite tracking? Not an option with a dog tracking through steep gullies and dense bush. Also the size and weight of the tracker was a major issue. And how to get the data back to the dog handler, who him/herself was out in the middle of nowhere, with no cellular coverage, and who would need a satellite downlink to follow the dog? No, the solution had to be using a direct telemetry radio link, with the option of radio repeaters. 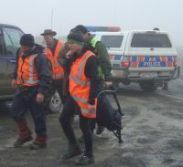 But, it would have to be able to be used by SAR New Zealand, without the need of a HAM radio operator to be present. This meant that the radios had to be New Zealand Type Approved, and that a suitable frequency had to be found and allocated. During this process it also became clear that this GPS radio tracking system would be extremely useful for all SAR teams in the field. If they could be live tracked, and shown on a topographical map at the forward field base, this would make any search much more efficient, the controller could see where his teams where with one look at the screen, send them to any location, and be able to confirm that they indeed did search all the required areas. There would also be a 'track record' for later use. We looked at the various options. We noted the ICOM system, but I did not like the idea to have to rely on this one company for the whole system. I would prefer a system that is fully 'open source' which would make it customizable, and not reliant on a single company, who may change or drop the system any time they liked. The obvious choice, for many reasons, was APRS, the Automatic Packet Reporting System, designed by Bob Bruninga in the 1980's . The system itself is based on the AX25 packet protocol, which has been in use for a very long time. APRS uses AX25 in the 'unproto' mode, which means it broadcasts a packet of data without waiting for a reply or confirmation. Hardware for APRS is readily available from various sources, and the firmware which runs on this hardware is mostly 'open source', so if required it would be possible to make changes in the way the system behaves. So far this has not been necessary, and the existing 'trackers' are extremely configurable. But APRS can do much more than just be used to transmit GPS coordinates by search teams and search dogs. It is a full Radio based messaging system in itself. In remote locations, just using radio, and through Digital repeaters, it can send and receive messages between laptops and even, if the Tracker has this capability, to the Trackers themselves. For example, the forward controller can put an 'Object' icon on the topographical map, to indicate a special point, and this will then automatically show up on the screens of all other stations following, or participating, in the search. All without Local Area Networks, satellites or cellular coverage. More on this in the Software development. For more information of the APRS system, check the new APRS website from Bob Bruninga at http://www.aprs.org/ . As we knew we where going to need a special frequency allocated, some decisions had to be made regarding the type of modulation, and the frequency. Basically, a full digital modulation system would be best (PSK, QPSK, etc.). This means that the transmitters used would be of a special type, designed especially for digital telemetry. The problem here was the cost of this equipment. Unlike standard hand held radios, these units are very expensive, and they had to be New Zealand Type Approved. We decided to stick to the standard system used by HAM radio operators using APRS worldwide, which is a standard FM radio connected to the Tracker by the microphone input and the speaker. 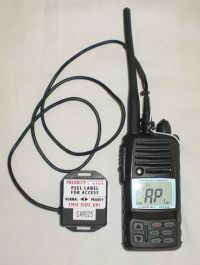 This would enable us to use of-the-shelf hand held type approved radios. Frequency tests where done with APRS trackers in various situations, using the HAM 2 meter and 70 cm bands. It became quickly clear that VHF had much better penetration through dense forest than UHF. Also, signals bouncing around hills came a long way further with VHF than with UHF. Therefore, it was going to be a VHF frequency. But, because our Digital Repeaters would have to work very close to the VHF Voice repeaters used by SAR and Police, we needed to be far enough away (in frequency) not to get or give interference with these voice repeaters. In the end, we managed to get allocated by RSM a nationwide channel in the EE band, which is in the 170 MHz range, and several SAREX tests where our Digipeater was installed next the portable Police voice repeater in the ESB band has given no interference issues whatsoever. 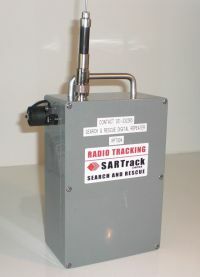 © Copyright 2009 SARTrack Limited. All Rights Reserved.